Workflows provide a standard structure for regular processes including onboarding new employees, delivering training material, or signing updated policies. Super managers can build and customise the steps in an initial workflow template, which then defines the process for each workflow that is created from it. Any authorised managers can then create those individual workflows, assign a staff member or candidate, and then monitor to ensure all data is collected, forms and contracts signed, and milestones hit. Other managers can be given varying levels of access, ranging from full access to the entire workflow, ability to view only, or to provide approval of just one or more stages within it. Before creating a workflow template, permissions for that workflow should be considered, in addition to the steps of the workflow. 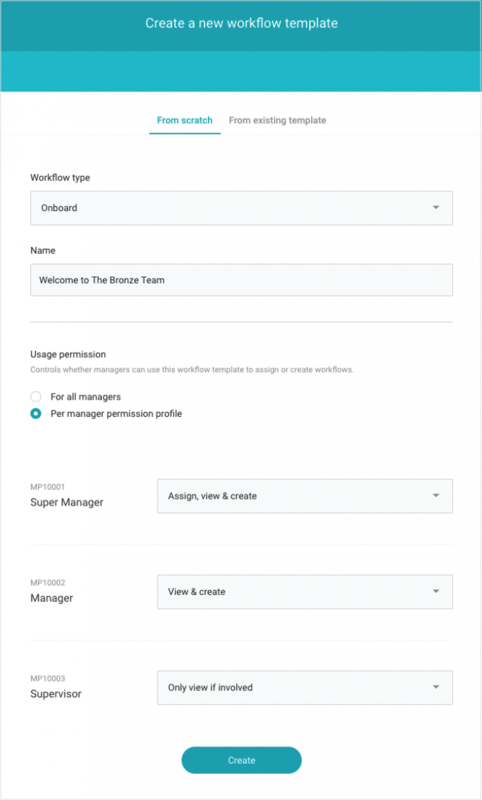 Permissions can be used to limit when a manager can view a workflow, create new workflows, and if they can assign a workflow to another manager or create them only for their own use. These manager types will only be able to view workflows based on this template if they’re involved in the workflow – either as recipient of a stage, or if assigned as the workflow manager. They cannot create new workflows using this template. Example: May be useful for supervisors or department managers. Manager types with this permission level can create new workflows to use themselves, but cannot assign another workflow manager. Example: May be useful for store or area managers. This allows managers to create new workflows using this template, and assign themselves or others as the workflow manager. All workflows using this template will appear on their workflows dashboard, and they can view them regardless of the workflow manager. Example: May be best suited to use by senior management including payroll, HR and super managers. There are several pre-existing options for workflow template types. The main type, used for onboarding, has predefined stages and milestones that are common onboarding requirements. These workflow template canvases are blank – there are no predefined stages or milestones. You’ll then be taken to the workflow template canvas, where stages and milestones are configured, ordered and assigned to participants.